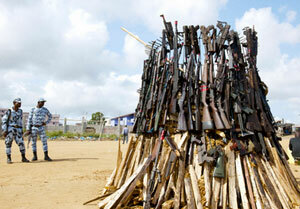 Africa is ground zero in the international debate on controlling the small arms and light weapons trade. For more than a decade, diplomatic activity to contain arms and ammunition transfers has been animated by a concern with instability and contagion generated by the continent’s many wars. Leading think tanks, research groups, and advocacy organizations have repeatedly drawn attention to the way the burden of armed violence in Africa is a product of low-tech assault rifles and anti-personnel land mines. The intensity of diplomatic activity to deal with small arms trafficking is remarkable when compared with the glacial pace of more conventional arms control negotiations. In 2001, United Nations member states agreed to a Program of Action (PoA) to contain illicit trafficking of arms. A rash of regional and bilateral agreements, most of them politically (rather than legally) binding, soon followed. And then, in 2013, a new Arms Trade Treaty was signed by over 110 countries and called for more stringent standards in the arms trade, including over assault rifles and ammunition. The vast majority of these efforts call for robust controls on the export, import, and brokering of small arms and light weapons. They also emphasize harmonization of standards and the sharing of information. Their focus is overwhelmingly on reigning in the “supply” of arms and ammunition in order to prevent their illicit diffusion. This supply-side bias is evident in many of the arms control efforts in Africa. For example, state signatories to the so-called Nairobi Protocol on the Prevention, Control, and Reduction of Small Arms and Light Weapons routinely call attention to the importance of transparency over arms exports and imports. There is a persistent assumption implicit in much of the debate and action on small arms and light weapons control, including in Africa. It is taken for granted that Western (and more recently Eastern) powers are responsible for the lion’s share of arms shipments to the continent. Routinely singled-out as among the largest distributors are the United States, China, Russia, Ukraine, Serbia, Iran, and some members of the European Union, especially Belgium, France, and Germany. It follows that weapons produced by these foreign powers are being brokered to nefarious state and non-state actors in Africa, and fuelling the continent’s wars. Many of Africa’s diplomats argue that the regulation of small arms and light weapons transfers must begin (and potentially end) by shutting off the tap from the West and East. According to the 2011 Small Arms Survey, at least 22 non-African countries were known to have supplied arms, munitions, and parts to the continent over the previous decade. As a result, the emphasis in arms control negotiations is often on controlling the hardware–from the point of manufacture to its export and import and arrival to the end-user. Not surprisingly, less attention is devoted to the dynamics of supply or demand in Africa itself. Yet a growing body of research indicates that ongoing international transfers, while influential, account for just a portion of Africa’s stockpile of small arms and ammunition. On the one hand, there is considerable “re-transfer” of arms between African countries. Intra-African trade and trafficking is potentially just as important as international commerce. Moreover, a sizeable surplus of left-over weaponry is readily available from armed conflicts waged during the 20th and 21st centuries. Just as significant, weapons are no longer uniquely produced and transferred from Western and Eastern countries to the south. The production and diffusion of weapons and ammunition is a global phenomenon, with Africa increasingly a player at all points in the trade. Since the early 1990s, the production of small arms and ammunition has spread to over one hundred countries. While nascent, a growing number of African countries exhibit some capacity to produce small arms and, more importantly, ammunition. Some of them developed independently: South Africa is today an established manufacturer of small arms and light weapons, a product of embargoes during the Apartheid era. A new study documents how others have pursued self-sufficiency with support from states like China, Iran, Pakistan and Russia. As a result, countries such as Ethiopia, Kenya, Namibia, Nigeria, Sudan, Tanzania, Uganda, and Zimbabwe are beginning to garner a small but expanding market share. In certain cases, African manufacturing capacities are a product of many fathers. Sudan, for example, is an increasingly significant producer of small arms and ammunition. Since 1959, it has operated rifle ammunition manufacturing facilities with aid from British and (former) West German companies. The present industry is run by the Military Industry Corporation (MIC) established in the early 1990s allegedly with support from Bulgarian, Pakistani and Ukrainian firms. The MIC claims that it produces copies of the Kalashnikov assault rifle, the US-designed M-16, the German-designed MG-3, G-3 assault rifles and the MP-5 sub-machine gun, withcomponents provided by outsiders. Although comprising less of a regional or international threat, “craft” or “homemade” industries—local and indigenous producers of weapons—are thriving in most, if not all, countries across the continent. This is particularly evident in Ghana, Liberia, and throughout West Africa, but also urban centers of Southern and Eastern Africa, where blacksmiths are hammering out crude weapons used in organized and petty crime. Faced with the need to scale-up their operations, rebel groups in Libya demonstrated remarkable proficiency in building surprisingly effective anti-tank and anti-aircraft weapons and munitions during the recent conflict in 2011. Put succinctly, weapons and more importantly ammunition made in Africa are increasingly being used by Africans. While international transfers from Western and Eastern manufacturers to countries throughout the region continue, military and civilian-style arms and ammunition are being re-transferred and produced locally for domestic consumption. In most African countries, the military and police remain the sole authority responsible for managing weapons and ammunition stocks and transfers. Yet there is mounting evidence of locally-manufactured ammunition being diverted from the arsenals of the armed forces and law enforcement to civilians. For example, Kenya’s Ordinance Factory Corporation (KOFC) started producing small arms caliber ammunition on a Belgian-supplied production line in the late 1980s. Based in the city of Eldoret and produced under state control, there are widely circulated reports of leakages from the KOFC. According to researchers, hundreds of thousands of cartridges were diverted to warring pastoral groups and criminals over the past decade. In some cases, military-style weaponry has been discovered in civilian arsenals, including warring pastoralists not just in Kenya, but also Burundi, Ethiopia, Somalia, South Sudan, and Uganda. Military and police departments in East and West Africa experience a comparatively high rate of diversion of arms and ammunition from their arsenals. Part of the reason for this is linked to political and social dynamics that influence such theft. It is not uncommon for senior political figures and representatives of the security forces to dole out arms and ammunition to their ethnic affiliates. For example, in Kenya and Uganda (and also across West Africa), military, police, and paramilitary personnel have reportedly diverted and distributed weapons and ammunition amongst tribes, clans, and sub-clans as a form of patronage. Likewise, forcibly and voluntarily seized weapons and ammunition, despite being under police custody, routinely go missing. Much of the diversion is facilitated by under-paid public security officials and exacerbated by poorly managed stockpiles. Notwithstanding the widely cited claim that Africa is “awash” with weapons, Africans possess far fewer arms than civilian populations in most upper and middle-income countries. In fact, there are only an estimated 39 million weapons dispersed among the 52 countries on the continent or three weapons for every 100 civilians. Whether in conflict, post-conflict or ostensibly peaceful settings, most of these small arms and light weapons are overwhelmingly possessed by households for private use rather than by militaries, police forces or even armed groups. In Africa, elsewhere, it is not necessarily the sheer number of weapons that trigger or sustain violence, but rather the inability of governments to ensure legitimate public security or assert authority and control over their territories. When thinking about strategies to reduce the threat of arms availability, it is more useful to think beyond a given weapons supply chain to also account for why and how weapons are used in Africa. It stands to reason that the gradual reduction in the overall number of armed conflicts in Africa and around the world since the early 1990s has also affected the dynamics of local demand, even if comparatively little research has been pursued in this area. Indeed, where armed conflicts come to an end, many weapons once used to wage conflict may find their way into the hands of private defense contractors, armed criminals and even pirates, as observed amongst countries lining the Gulf of Aden. There are a number of practical ways to enhance security governance and ultimately reduce diversions and leakages from national stockpiles. For example, it is critical that African governments and their security sectors start implementing basic checks and balances and establish management practices. At a minimum, these actors must undertake routine and thorough assessments and audits of public armories, including those managed by military and policing entities. What is more, security forces require careful vetting procedures, appropriate and regular salaries, and training in basic principles of accountability. There are some promising examples of states seeking to manage both the supply and demand dimensions of small arms and light weapons availability. But if security is to be enhanced in the long-term, it is critical that African governments and their supporters move beyond a rigid interpretation of arms availability in reservedly supply-side terms. The current focus on export and import controls, regulation of brokering and promoting border and airway controls on trafficking while necessary, is insufficient. While all legitimate priorities in their own right, interventions must be expanded to account for how weapons are “demanded”— that is, the multiple modalities by which they are supplied, acquired, re-circulated and used. Robert Muggah is research director of the Igarape Institute and directs policy and research at the SecDev Foundation. He is a peace scholar in residence at the University of San Diego’s Joan B. Kroc School of Peace Studies and a fellow at the Canadian Defence and Foreign Affairs Institute. This submission draws from a recent article co-authored with Francis Sang.